Are There Sinkholes in North Carolina? 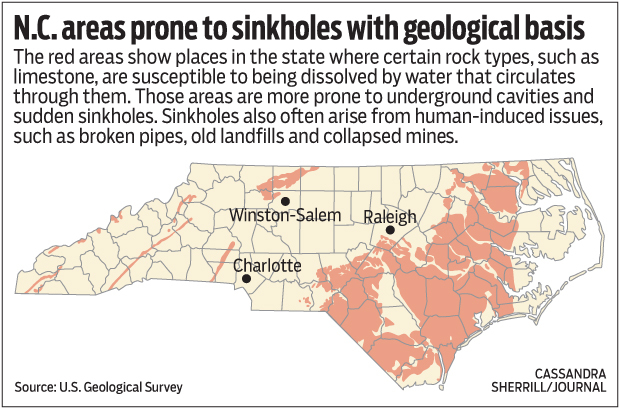 Sinkholes have been making the headlines across the nation; do they happen in North Carolina? How does insurance coverage affect damage caused by a sinkhole? Early in 2013 the nation was shocked when a Florida man lost his life when he fell into a twenty-foot-wide sinkhole underneath his home while asleep in his own bedroom. Local reports show that insurance inspectors had made a routine stop less than a year before to make note of any signs of a sinkhole, yet uncovered nothing. Now the neighborhood has been quarantined and deemed unsafe by officials. Statistics show hundreds of sinkholes occur in Florida annually, but are there sinkholes in North Carolina? Sinkholes may occur anywhere, on public or private property, and put innocent people at risk of injury and may swallow buildings, roads, and vehicles wherever they occur. 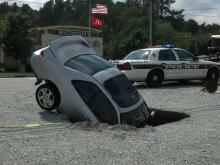 In 2012, an eight foot-wide sinkhole in Durham swallowed a car driven by a law student. The car was turning in a parking lot when the ground opened up. In this case, the property owner was aware of the hole and had identified the area with caution tape. However, the tape had blown away in the wind and drivers were unaware of the threat. In April 2014, a sinkhole in Mooresville foced NC-3 to shutdown for repairs. Later that year in September, a sinkhole redeveloped on Hammond Road in Raleigh caused by an underground pipe. Just a month later, a sinkhole in Asheville developed in a restaurant parking lot after a nearly century-old underground pipe was removed. Individuals and businesses should check their insurance policies to learn if damage caused by sinkholes is covered. Sometimes it is necessary to purchase additional coverage in order to include this type of damage. Sinkholes are not often recognized as catastrophic occurrences, in which case a traditional homeowner's insurance policy would not include compensation for sinkhole damage. Stand-alone sinkhole insurance policies are available. It does not mean sinkhole damage is non-compensable if an insurance provider fails to provide the coverage as outlined in their policy. It does mean that the insurance company is acting in bad faith, and an insurance dispute lawyer in Raleigh can help successfully settle a North Carolina insurance dispute. When an insurance dispute occurs, policy holders are usually confused about the complicated language in their policy and still struggling with repairing structural damage or recovering from physical injuries caused by the sinkhole. Having an insurance dispute lawyer dedicated to the settlement of your claim will allow you to focus on rebuilding your life with your loved ones. Sorry to hear that. Please contact our firm and we will review procedures, insurance claim steps, and more about what may develop as a loss from a sink hole.